Cambridge won for the third time in four games with a solid display at home to struggling York. Jimmy Spencer's header and Josh Coulson's volley put the home side two goals up before James Berrett's top corner strike brought York back in it. Ben Williamson capitalised on Scott Flinders' spill from Spencer's driven shot to regain the two goal cushion. The U's Luke Berry chipped a late penalty over the bar after Dave Winfield's clumsy foul on Leon Legge. "I think everyone was wondering how we would respond after a difficult afternoon last week. "I thought we controlled the game from start to finish. We could have scored a lot more goals, we could have been more ruthless, but the key to it was reacting and getting the three points. "It was a real accomplished 95 minutes. You reach for the stars as we always do, but I'm delighted with the three points, the calibre of the goals was pretty decent as well." "It's disappointing. I thought we started well. I think from our point of view we had too many off it today. "Physically, I thought they caused us problems up front and we didn't handle that. "I thought they handled the conditions better than us and that was the difference in the game." Match ends, Cambridge United 3, York City 1. Second Half ends, Cambridge United 3, York City 1. Reece Thompson (York City) wins a free kick on the left wing. Ryan Ledson (Cambridge United) wins a free kick in the defensive half. Corner, Cambridge United. Conceded by Josh Carson. Corner, York City. Conceded by Harrison Dunk. Substitution, Cambridge United. Ryan Donaldson replaces Luke Berry. Penalty missed! Bad penalty by Luke Berry (Cambridge United) right footed shot is just a bit too high. Luke Berry should be disappointed. Penalty Cambridge United. Leon Legge draws a foul in the penalty area. Corner, Cambridge United. Conceded by Lubomir Satka. Corner, Cambridge United. Conceded by James Berrett. Attempt saved. James Spencer (Cambridge United) right footed shot from outside the box is saved in the top right corner. Goal! 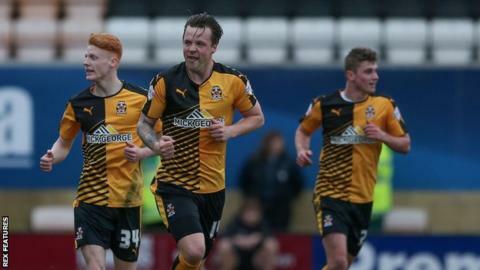 Cambridge United 3, York City 1. Ben Williamson (Cambridge United) right footed shot from very close range to the bottom left corner. Attempt saved. James Spencer (Cambridge United) right footed shot from the centre of the box is saved in the centre of the goal. Corner, York City. Conceded by Josh Coulson. Corner, Cambridge United. Conceded by Luke Summerfield. Attempt saved. Harrison Dunk (Cambridge United) right footed shot from outside the box is saved in the top left corner. Corner, York City. Conceded by Ryan Haynes. Attempt missed. Ben Williamson (Cambridge United) right footed shot from the centre of the box is close, but misses to the right. Attempt missed. James Spencer (Cambridge United) right footed shot from the right side of the box misses to the right. Attempt missed. Ben Williamson (Cambridge United) left footed shot from outside the box misses to the left. Lubomir Satka (York City) wins a free kick on the right wing.